Can be included in a health unit for health class as well as a disease unit in Biology class. Before starting the interactive, ask students to predict what kinds of health issues might stem from increasing global temperatures over time. List of potential dangers is formidable and may frighten younger students. Essay is definitely written for a high school audience. 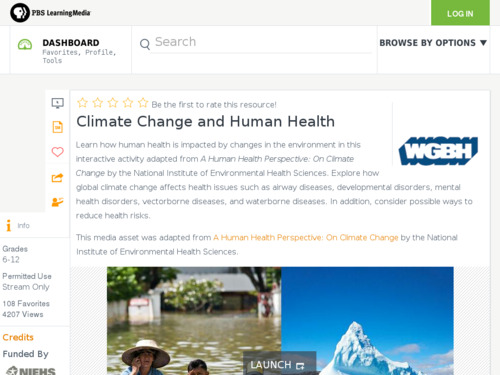 This is a basic, introductory resource about the connection between climate change and human health. Interactive includes possible ways to reduce health risks. Comments from expert scientist: Provides legitimate possible effects of climate change on human health that are both realistic and justified within the text. Many different resources that are used are not cited. Background essay and discussion questions are provided. Educators can easily expand upon the discussion questions that are given to ensure a more thorough debate. Interface is simple and easy to use.